Most humans are probably familiar with the two fleshy eyelids we use to protect our eyes. Most vertebrates, however, have a third eyelid that they can also use to cover their eye. This eyelid is usually a thin white membrane that moves horizontally across the eye, and is called the nictitating membrane or palpebra tertia. 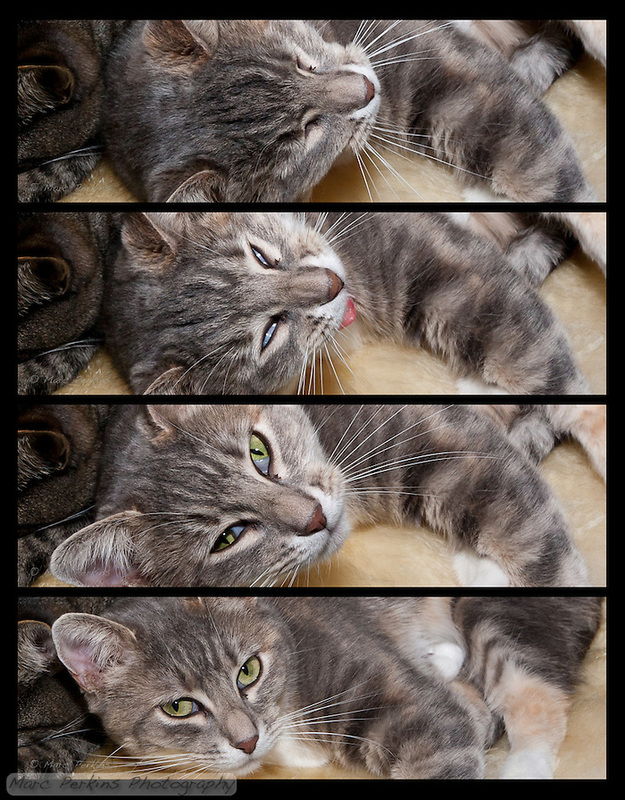 Lucca, a blue patched tabby and white adult female cat, shows off her third eyelid in this sequence of four photographs taken just after she woke up from a nap. Lucca here is simultaneously stretching, yawning, and opening her eyes after waking up from a nap. In the first (top) image Lucca’s eyes are completely closed and she’s just starting a yawn after waking up from a nap. In the second image her outer two eyelids are partially open, but the nictitating membrane is still entirely covering the eye (the nictitating membrane is visible as a white layer completely covering the eye; compare the second picture to the third and fourth and note that you can’t see her green eyes at all in the second picture, even though the two outer eyelids are open). In the third image the outer two eyelids are almost entirely open and the nictitating membrane is about half covering the eye, and in the fourth (bottom) image all three eyelids are fully open. While this may not be a perfect view of the membrane, one of the things I’m happiest about with this series is that the opening of the eye is entirely natural: Lucca was just behaving normally (tongue sticking out and all). Most images I’ve seen of the third eyelid in cats involve either a cat with an eye problem or someone prying open the eye with a finger to show the membrane. To see more pictures of my cats (are you sure you want to enter the depths of my cat pictures? ), head to my Cats Gallery or my Cat Closeups Gallery. Great illustration of the nictitating membrane! One of our cats sometimes sleeps with her eyes open which made me curious about it and this gave me a better idea what I’m looking at.